Bright Idea #96: When you go on a trip to buy a special surprise for your best friend, sing “You Are My Sunshine” and think of all the big people and the little people who are your sunshines. Then look at the old houses you pass, and think about the people who lived in them, and hope that they were somebody’s sunshine too. That idea is the heart of this book. That there are times when some spark—a person, an incident, or both—enter your life like soft rays of sunshine gliding through an ajar window. And not only do these sparks brighten up the dark clefts within and without you, they actually turn out to be catalysts in transforming you into a bundle of sunshine. The Book of Bright Ideas celebrates these sparkling agents of change. The narrator, nine-year-old Evelyn Peters, or Button as we better know her in the book, doesn’t have the faintest idea of the extent to which her life would change with the arrival of two strangers in their town. Twenty-something Freeda Malone and her sister, Winnalee, the same age as Button, enter the rural Wisconsin township like a sudden gust, threatening to blow over the steady but mechanical lives of the Peters family. The summer of 1961, the year these two ladies make this place their home, undoubtedly emerges as the biggest and wildest summer in the life of Button and her family. It is the summer when the timid nine-year-old would find a voice she can call her own, the time when her stiff and perfectionist mother would “loosen up” quite a bit, the year when her living dead father would find his music and his life back. And while all this happens, two little girls would pen down a book together. It’s their Book of Bright Ideas. It’s a good thing Sandra Kring introduces the two strangers in the book’s first chapter. With them in place, the reader gets to see the whole range of characters—the book’s strongest aspect. Uptight Button versus buoyant, untamed Winnalee, huge-sized and giant-hearted Aunt Verdella vis-à-vis skinny, insecure Jewel–Button’s Ma, easy-going Uncle Rudy in contrast with sedate and dreary Reece Peters–Button’s dad. The characters are so real they almost leap out of the pages and share the living, breathing space with you. Button, all of nine years old, has already a lot to deal with—her mother’s missionary-like strictures, the idea of being ugly like her mother, the apathy of her father. No wonder the child grows up timid to the extent where she copes with her fears by chewing on her gums often to the point of bleeding. Jewel herself is seen to struggle with complexes of being ugly and inadequate fostered during her childhood. She masks them under a cover of perfectionist stiffness, the very feature that distances the two people who should be closest to her—Button and Reece. The same two people who are equally drawn to the household of Rudy and Verdella Peters—a couple embodying love and the joy of carefree spirit. Then there’s the fiery Freeda and the dazzling Winnalee. The latter, moved around from one place to the other by her older sister, ends up being Button’s first “best friend.” From the very start we see her carrying the two most important things in her life—a vase containing her dead mother’s ashes and a bright leather-bound book. This book is the vine that twines the novel together, for in it Winnalee and Button note down the bright ideas they come across through their experiences. Winnalee believes when they have a hundred bright ideas, they would have figured out all the clues to life. A series of episodes—from a community cookout to a stormy outburst by Jewel toward Verdella—lead to a complete reversal of the scheme of things. Just like her daughter, Jewel Peters finds a best friend, too—in Freeda Malone, the young woman she had detested initially. And Verdella and Rudy? Do they change? Why yes, they become more of themselves—more loving, more joyful. 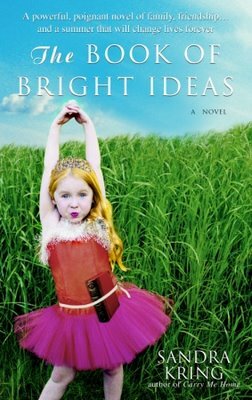 The Book of Bright Ideas shines, not only with its amazing cast, but also with the charming atmosphere of a rural small town. In this second book of hers, Kring brings about the same community spirit that marked her brilliant debut novel, Carry Me Home. The coming together of the townsfolk for a cookout with food, drinks, and a wagonload of gossip; the animated community sales, where the selling of knick knacks brings those extra pennies all working families so appreciate; the 4th of July “Marty Graw” celebrations that sees the Peters and Malones letting their hair down in true American style and spirit. Kring is the kind of writer who sweeps a large number of readers with her words. A big reason behind this is her use of strikingly simple and conversational language to tell complex stories. In both her books, the protagonists are children, who observe and present facts much as they happen, without colouring them. Yet, within that simplicity rests the intricacies of human nature, the wisdom that comes from appreciating life as it is, and the conviction that even the worst of blows can’t trample the peace and beauty that dwells in the human heart. The Book of Bright Ideas surprised me at many a bend, with the plot throwing up unexpected twists, compelling me to keep moving without putting the book down. I remember keeping awake until four in the morning on one occasion, closing the book only when I felt reassured that the characters were safe and there was no reason to worry. How naïve I was. Yes, the worry might have been over, but not the surprises. While the story itself has a spell-binding effect, what nourishes the reader the most is the heartwarming transformation of the characters. It all happens naturally, none of it is forced. Therein lies the triumph of this book and the message it caries. That long after the agents of change are gone, the newness you acquire because of them remains unblemished. And then, you yourself become an agent of change in other people’s lives. This is indeed one bright book. My Bright Idea #1: If after switching off the lights once the final page of a book has been turned over, you feel your eyes are wet but your inside is smiling with a big-sized “happy,” don’t forget to share the gift with other book-loving friends. Sounds like a wonderful read indeed 🙂 Thanks for sharing! Lovely, Bhaswati, and a lovely review.”You Are My Sunshine,” was my son’s bedtime lullaby. Great review. I’ll keep an eye out for this. Thanks, all! This is one of those books I can guarantee no one will be disappointed with. I highly recommend it. It sounds like a terrific book! I’ll write down the title and try to get to it sometime.Thanks for sharing! Marti, I am sure you will enjoy reading this title. It packs a punch in terms of humour too.